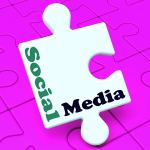 Do you feel like you are missing a piece of the social media puzzle? CATCO Enterprises can help you, call us today for a free, no obligation chat about your social media needs. Social media is a great way to start a conversation with your audience, it can improve your brand awareness and help you reach more customers. Delight your audience before your even meet them. We all want to feel special, know we are going to be looked after so we tend to do business with people we know, like and trust. Remember the key is we do business with People, not businesses. By using social media you are able to build trust and allow people to get to know you. Social Media is quite complex and if you are posting the same content in the same way across multiple platforms you will be forgiven for thinking social is just a big waste of money and a huge time drain. There are so many different forms of social media, new ones keep arriving all the time. These are the biggest. Each social platform is different in the way the audience reacts to your content and what they expect your content to be like. Age groups of your followers are different, the products they are looking for and their needs all vary depending on the social platform you are posting on. Your social media campaign should be a part of your whole integrated marketing strategy that showcases your business and gets you in front of your existing and potential new customers. A buyer’s journey consists of multiple touch points and they often won’t buy until they have verified your company, your products or your team. By making their sales journey easy then your conversion rate will be higher. Video is cutting through the ice and making customers into an advocate in no time at all, helping to establish your authority in your industry and the must have supplier. We offer a range of package from setup to complete done for you social media options. Obligation free quotes.